Zusammenstellung der raren und seltenen Aufnahmen von David Hess aus den 60er und 70er Jahren. DER David Hess, der nicht nur in Wes Craven's "Last House On The Left" einen Prototypen des Slasher Films spielte (siehe SPLATTING IMAGE Nr. 49), sondern auch als genialer Songwriter Geschichte schrieb. Z.B. Für Elvis "I Got Stung",, oder "Speedy Gonzales" für Pat Boone. Hier endlich seine eigenen aussegewöhnlichen Werke. Elvis Presley's I Got Stung - also well known in the version of The Beatles - and Speedy Gonzales, interpreted by such different singers as Pat Boone or Rex Gildo, all songs have one thing in common: They were written by David Hess. In the sixties and seventies the Californian supplies innumerable artists with his hits and receives a Grammy twice. However, his cooperation with Elvis Presley lasts longest. Besides I Got Stung the following famous titles sung by the King have been penned by David Hess: Frankie and Johnny, Come Along, Make Me Know You’re Mine, Sand Castles, Blue Lagoon and Your Hand, Your Heart, Your Love. David Hess is also active as an actor since the early seventies. He plays in various, much admired horror and crime movies; the most well known is probably Last House on The Left (1972) (for which he contributed the soundtrack as well) by Scream - director Wes Craven. Who later engages David Hess for his version of Swamp Thing (1982). More films the 62-year-old starred in are: 21 Hours at Munich (1976), Valley Of The Dolls (1981), Let’s Get Harry (1986) and alongside Dennis Hopper, White Star (1983). 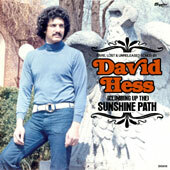 Besides his work for other artists, David Hess wrote songs for himself as well. The here available compilation contains the best of these rare and unpublished gems. The highlight is 60s Flower Power Sunshine Pop garnished with Psychedelic as in Sunshine Path or Central Park. Opulent ballads indicating his closeness to Elvis (Morning, Through The Looking Glass), soundtrack contributions from the films Last House on The Left and Potato Fritz as well as two cover versions of Summertime and Living Doll are showing the stylistic range of his work in the 60s and 70s. These songs caught the sun: Glorious melodies, catchy hooks and wonderful vocal arrangements. This summer David Hess will present these songs and his evergreens for the first time on a tour through Germany and Europe. Exact information will be announced. The CD and LP artwork contain exclusive liner notes by David Hess himself as well as photos of his music and movie career. The vinyl edition is limited to 500 hand numbered copies!